Although the Nokia 9 PureView may have been delayed until early 2019 due to the camera software not yet being perfect, it seems as though the smartphone’s design is largely finalized as, just weeks after a case for the smartphone appeared, a new one has popped up on Amazon. 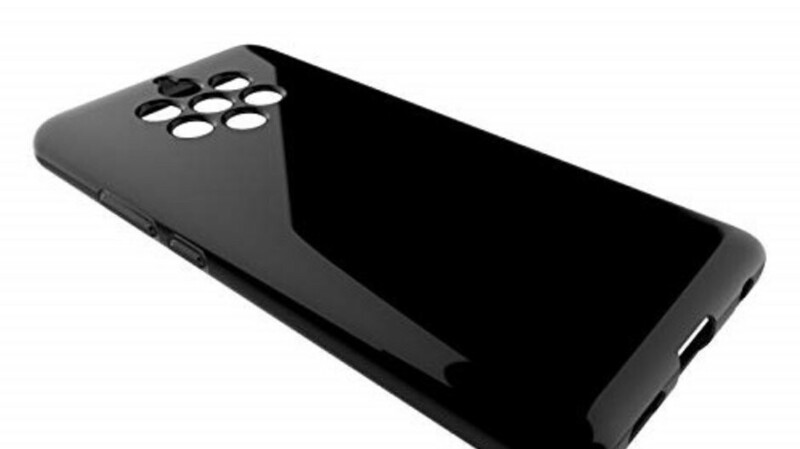 Unfortunately, the case in question isn’t accompanied by renders of the smartphone, so the front panel design isn’t visible. However, the cut-outs on the rear do confirm the odd-looking camera layout that previously leaked. This, for those unaware, should consist of a whopping five rear cameras – each with a different function – accompanied by a large LED flash and a laser autofocus system. Additionally, the system is understood to have been developed alongside ZEISS Optics, which means the latter’s branding will be present. Aside from the rather impressive camera system, the Nokia flagship is rumored to feature Qualcomm’s Snapdragon 845 along with 128GB of internal storage and 6GB of RAM. Furthermore, a recent leak revealed that the device would arrive with Android 9 Pie straight out of the box, presumably in its stock form as part of the Android One program. Also, this particular case points towards a 3.5mm headphone jack on the bottom of the phone. At the moment, it’s unclear when exactly the Nokia 9 PureView will make its international debut. According to the most recent info, though, HMD Global – the company behind Nokia smartphones – is planning an announcement after January’s CES 2019 and before February’s MWC 2019. I'm still not sold on the gimmicky camera, but hopefully Nokia will be able to make a hit. And for the love of God please don't make the names so confusing. I can't wait for this phone to be released. That 5 camera setup definitely won't be a gimmick if it nails the imagery. Nokia 9 isn't a confusing name, either. If it is, the name iPhone 8 must be just as confusing, lol. If it's not a gimmick then show me another phone that has the same camera setup as the Nokia 9. As for the name, you know what I mean. It's not remotely the same as the iPhone names. The amount of cameras doesn't make it a gimmick. That's ridiculous. And Nokia 9 is exactly the same naming strategy as the iPhones. You're making a mountain out of a mold hill for no good reason. ;) they might want to watch it before they hit them with an IP lawsuit. What OEMs need to do is get the software right as well. Google-like software processing paired with useful hardware advancements is where the real future of smartphone photography is headed and Huawei is pretty close to that scenario currently. Google is still a step ahead in some areas but at the same time Huawei has surpassed them in others. I agree. Google has it right with a combination of software optimization and hardware with the Gcam. I don't think any other phone can compete imo. Agreed. Huawei currently has the best camera's on its smartphones, even beating out the best of the best.